Oligonucleotides (or oligos for short) are one of the most important tools in modern day molecular biology. Without oligos, today’s biotechnology, diagnostic, and pharmaceutical industries simply couldn’t exist. To understand what is so special about oligos, we should first answer an important question: What is an oligo? Oligos are short, synthetic strands of DNA or RNA. The word oligonucleotide is derived from the Greek word olígoi, meaning “few” or “small”, and nucleotide, which are the building blocks of nucleic acids, such as those in DNA. Oligos are chemically synthesized, and are used in many different areas of scientific research and development. Soon after the chemical structure of DNA was solved and published in 1953, there was fervor to learn as much as possible about how it works in biological systems. By 1955, researchers published the first attempts at building synthetic DNA strands to aid with research, and the research community created the word oligonucleotide to describe these molecules. . The chemistry of DNA synthesis has an intricate history, one that is recounted beautifully by one of the technologies inventors, Martin Caruthers, in his open access paper. Contemporary DNA synthesis utilizes Caruthers’ phosphoramidite chemistry, and has remained substantially unchanged for over 30 years. Oligos have become a cornerstone in molecular biology, synthetic biology, and biotechnology. This is largely due to synthetic DNA and cell-made DNA having identical structural and chemical qualities. The only difference between DNA made with phosphoramidite chemistry and DNA made within a cell is where it came from. For over 30 years, oligonucleotides have made huge waves in science by facilitating the polymerase chain reaction (PCR). The PCR is like photocopying a page of a book for DNA. However, unlike normal photocopying, in PCR the photocopier (an enzyme called DNA polymerase) has to be brought to the paper (the DNA) to make copies. Researchers use short, single-stranded oligos (20-30 nucleotides) that are synthesized to have a nucleotide sequence complimentary to the outside edges of the DNA sequence that is the target for copying. By using specific temperatures, the double stranded helix of the target DNA is opened, the oligonucleotides bind their complimentary sequence on the target, and DNA polymerase starts copying from the oligo-DNA duplex. Repeating the temperature cycles amplifies a single, specific DNA strand into billions of identical strands. This technology powers many applications, including diagnosis of unknown pathogens in biological samples and genetic fingerprinting in forensic science. While PCR uses short oligos, current DNA synthesis methods can make oligos of 200 or more bases long. Long oligos are being used to speed up drug development processes, to generate DNA-based nanostructures for applications like targeted drug delivery, and to archive digital data for tens of thousands of years. With simple chemistry, strings of A, T, C and G, nucleotides can be created in any desired order, one base after another, snapping together in a similar fashion to Lego pieces. Today, many companies, including Twist Bioscience, synthesize oligonucleotides en masse for academic and commercial use. While the early methods focused on building oligonucleotides one at a time, current synthesis technology developed at Twist Bioscience can write approximately 1 million unique synthetic oligonucleotides simultaneously. Each oligo’s sequence is bespoke — designed for their specific application after synthesis. Instead of the traditional plastic or glass used as the surface on which to chemically “write” DNA sequences, Twist Bioscience harnesses the properties of silicon to enable synthesis of oligos on a world-leading scale. Silicon, the 14th element in the periodic table, and the second most abundant element on earth, is most famous for its use in semiconductor microchips in computers. It forms a dense, highly-uniform crystal lattice — excellent for engineering on a micro-scale. Microchip engineers can manufacture microscopic circuits into a microchip by controlling the silicon lattice’s chemical properties, making computer components increasingly tiny. Accordingly, Twist Bioscience can manufacture microscopic reaction clusters on a silicon plate to decrease the volume while massively increasing the throughput of the synthesis process. By combining the phosphoramidite reaction with writing onto a silicon platform, we have fine control over where our DNA strands are synthesized, and the sequence of nucleotides they contain, and the phosphoramidite reactions can be massively scaled up without compromising quality. One of the silicon-based plates used by Twist Bioscience to synthesize hundreds of thousands of oligos simultaneously. Researchers traditionally study gene function by observing the changes in a cell or organism when a gene is changed or deleted. For example, if a typically square shaped cell is circular when a particular gene is absent, it can be inferred that the absent gene controls “squareness”. However, what if the researcher has no idea which genes are responsible for a function, or where in the genome they exist? How do they decide which gene to delete? This is where massively parallel oligo synthesis becomes a game-changer. In order to remove a gene, genome-editing tools are required. A system called CRISPR is the most powerful tool for the job. CRISPR has two parts — a protein that acts as “nano-scissors”, cutting DNA like you would a ribbon, and a nucleotide-based guide that tells the scissors exactly where to cut. Each guide is typically less than 100 bases long, so can be encoded by a single oligo. With this system, a researcher can precisely snip out any part of a cell’s genome. 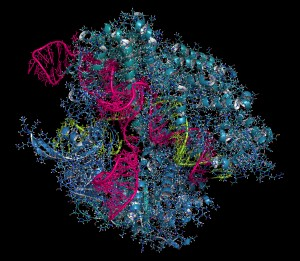 The three dimensional protein structure of the enzyme Cas9 — the scissors able to break the chemical bonds in the DNA backbone as part of the CRISPR system. Using next generation DNA synthesis technology, a pool of many oligonucleotides can be produced that, when transcribed, encode enough guides to delete every gene in a cell’s genome many times over. Therefore, researchers do not need to decide in advance which gene to delete — they can delete as many as they would like, one at a time, and determine which ones are involved in the behavior they are studying. In order to find the genes involved in a cellular function, millions of cells are each given a pair of CRISPR scissors and their own unique guide from this huge pool. CRISPR gets to work, creating a “library” of cells, each with a different gene deleted from their genome. Researchers then find cells that are behaving abnormally for the function of interest. Then, to uncover the genes responsible, the sequence of the abnormal cell’s genome is analyzed to find what has been deleted by CRISPR. Using this method, previously unknown gene mutations that cause devastating, untreatable diseases like cancer and Alzheimer’s are being discovered. These faulty genes can then be integrated into a laboratory culture of cells, which will become a disease model to study in detail. Researchers are able to develop new and novel therapeutics that target the incorrectly functioning parts of the model cell, that may one day put an end many terrible diseases. Possibly the most innovative application for oligonucleotides has nothing to do with living organisms — they can be used to store digital data! Digital data is currently archived on huge banks of magnetic tape, and is accessed slowly by robotics — not dissimilar to a giant jukebox. This system is a poor long-term solution for data storage. It takes up large amounts of physical space and requires specialized storage conditions (and a lot of energy), so is not sustainable as the amount of digital data being generated keeps growing. Also, the tapes only have a lifespan of around ten years. A new copy of the entire archive must be made regularly, at huge expense. A collaboration between researchers at Microsoft, Twist Bioscience, and the University of Washington has developed a way to store digital data as sequences of DNA. Instead of the binary data (ones and zeros) being stored on tapes, data can be encoded into quaternary data and be stored in DNA as A, T, C and G nucleotides. DNA is a truly amazing resource for storing data. The upper-limit for storage in one gram of DNA is around 1 zettabyte. That’s 1021 bytes, or one trillion gigabytes! DNA oligos also take up very little physical space and are stable for thousands of years, making them ideal candidates for long-term data storage. To extract data stored in this way, the oligos would be run on a DNA sequencer. The sequence can then be decoded back to the binary digital data. Both the encoding (writing millions of oligos) and decoding (DNA sequencing) steps already exist, now it is up to researchers to further develop these technologies into an affordable data storage solution. We expect many more exciting advances in this field in the future. If you are interested in learning more, check out our previous blog post where we discuss the subject at length. Researchers also use oligonucleotides to power more efficient, greener chemical synthesis. By assembling oligonucleotides together into longer fragments that encode synthetic genes, they can instruct bacteria or yeast cells to make specific enzymes (a type of protein). All cells make enzymes to catalyze chemical reactions. However, many of the chemical reactions required for life can be repurposed to produce useful compounds that would be very difficult or expensive to obtain using traditional chemical synthesis methods. The three dimensional protein structure of alcohol dehydrogenase, an enzyme in the body that converts ethanol consumed in alcoholic beverages into acetaldehyde. Instead of traditional chemical synthesis, researchers string together enzyme reactions. The genes encoding these enzymes are stitched together into entirely new genetic pathways that a bacteria or yeast can utilize. These organisms can be considered miniature factories. Billions of cells, each containing the introduced enzyme pathway, are used to convert low-value precursors like plastic waste into high-value chemical products, without the need for harsh reaction conditions or environmentally dangerous chemicals. Waste plastic — a potential starting point for the green enzymatic synthesis of chemicals. Using oligonucleotide-based technologies, new and novel therapeutics, commodity chemicals like perfumes, and even textiles for durable clothes are being developed. Where would science be today without the oligonucleotide? We would have a difficult time developing new drugs beyond early phases, as oligonucleotides allow us to develop new cell lines for testing treatments. We would arguably have a poor understanding of many human diseases, many of which we are now able to treat. Using Twist Bioscience’s silicon-based DNA synthesis technology it is possible produce more oligos at higher quality than ever before. So, to answer the question “What is an oligo?” — well, an oligo is a small DNA molecule with a world-changing history and a bright future!